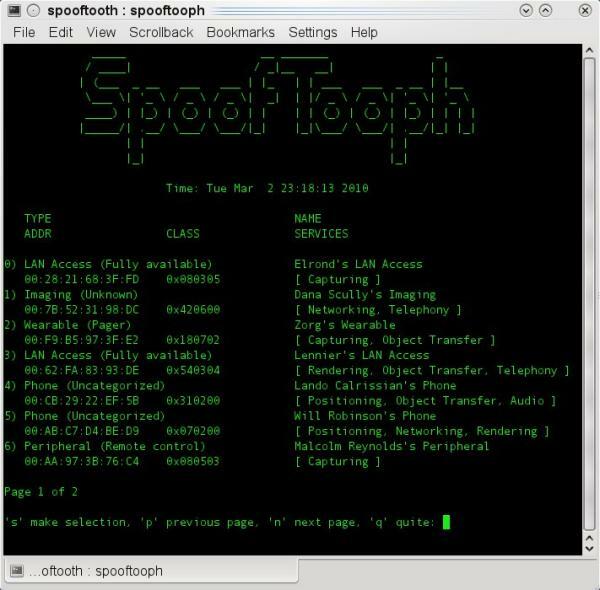 Spooftooph is designed to automate spoofing or cloning Bluetooth device Name, Class, and Address. Cloning this information effectively allows Bluetooth device to hide in plain site. Bluetooth scanning software will only list one of the devices if more than one device in range shares the same device information when the devices are in Discoverable Mode (specificaly the same Address). 1) Specify NAME, CLASS and ADDR. 2) Randomly generate NAME, CLASS and ADDR. 3) Scan for devices in range and select device to clone. Optionally dump the device information in a specified log file. 4) Load in device info from log file and specify device info to clone. 5) Clone a random devices info in range every X seconds.